4.2 out of 5 based on 291 bloggers and 142 commenters. 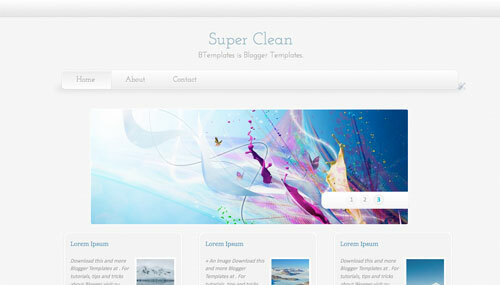 Super Clean is a free premium blogger template with 2 columns, right sidebar, gallery-styled, web 2.0 design, rounded corners, minimalist, an exclusive design for Blogger, slider, posts thumbnails and neutral colors. Excellent template for blogs about fashion or photography. How can I have more than one author box description? My blog has other colaborators and no matter who posted the author description is always mine. Is there a way to add others so that when they post, their description box appears instead of mine? 1 – Slide 1 – In the case would have to remove that because you removed the slide 1 up there. Well, I know nothing more than HTML’m getting to do something. I hope I helped. How can I put text on each slide? Do not come with that option. I’m having trouble changing my “home” and “about” pages from the side links to the top tabs and have them appear on my home page. Hello, I’m trying to change the image and text in author box description. How can I do that? I’ve looked it up in the html code but I can’t find it. I have tried to find this text on my template HTML, but I’ve found nothing. What should I do? I also would like to know how to change this. Been trying to find out on the template’s HTML setting. But it turns to nothing, what should I do? For All those who have problem with showing only 1,2 or posts on main page I found the solution. Problem is auto pagination in blogger. Try to add read more after first paragraph in every post. The other thing that can cause this problem is if you drag and drop pictures in posts and they are too big. Pictures must be insterted via insert picture. How do I change the slideshow images? I want to upload my own favorites. Please help! Well, first you have to choose the 3 pictures you will use. All of them should be on size of 800×289 pixels. Then you have to upload it to image hosting website like photobucket or anything like that. Then Go to dashboard > template > edit HTML. Then use ctrl + F to find the words “SLIDESHOW IMAGES” on your HTML box. After all, you will find 3 major a href code below the “SLIDESHOW IMAGES” text. Copy the code of the 3 pictures you got from image hosting web. and replace the link inside the a href code. Thank you for this template. Its innovative and very well done. Love the template, just wondering how I can enable threaded comments? I’ve tried following a couple of tutorials without any success and reverting the widget entirely kills the template. Hi I add a facebook comment box, but the facebook comment box is not in english language. Please help me on how to change it to English. Thanks. oh i am so happy to find this beautiful site. please how to create sub pages or a Drop Down Menu to this template ? Please help! I’m new to blogger but I need this for my school project. I wonder about how to add drop down menu bar for this template? Great template, I love it, thank you! My issue is 4 posts show up on my homepage, and when I add jumpbreaks to each post to make more show up on the homepage (the amount I select in Layout>Blog Posts – 9) the ‘Read More’ on each of the homepage posts moves to an odd location. My issue is it automatically has 4 blog posts on my homepage and it looks very uneven because it should be in sets of 3. I chaned my Layout>BlogPosts >Number of posts on home page to 9, but 4 still show up. I added jumpbreaks to each post which solves the problem, but then on my homepage the “Read more” link moves to an odd place. Help please! Either how do I get the proper 9 posts on my homepage without adding jumpbreaks, or how do I get the ‘Read more’ to move back to its proper place. Bonjour j’ai un problème quand je veux le transférer sur mon blog, blogger me laisse comme message: “Impossible d’enregistrer le modèle. Is there anyone there can give us the solution how to remove it? Nice template, using it and loving it. Thank you. One query though, I have set the posts to 6 per page but on some page it shows only 5. Any input will be appreciated. Hi! I love this template, thanks! I have just one problem: I use sometimes italic fonts in post, but in my blog it is just normal. What should I change? Hi. I really love this template. But I would like to completely remove the authorbox and have just one image (not the slideshow). How do I do this? Hello, sorry about my english! i really like this template for my blog but when i am try to download the only one way to use is created a new wix page, but i use blogger. I am getting the following error message. What am I doing wrong?